There’s a lot to look at in Chris Macdonald: Recent Sculpture, on view through October 21st at Anders Wahlstedt Fine Art, even though the exhibition covers just a few square feet. That’s because the show’s approximately 135 works — ranging from quite small to minuscule — are distributed across a single table in the middle of the gallery’s main space. They are made of galvanized sheet metal that has been snipped and folded into freestanding objects resembling toys, and finished with vibrant enamel paint in saturated colors. Individually and collectively, they are delightful, and provide a lot to think about, too. More conceptually ambitious than it may at first appear, Macdonald’s project operates within multiple frames of reference: as polychrome sculpture, as installation, as a product of serial production and, possibly, as commentary on the nature of creative endeavor and the art object itself in contemporary American culture. And it makes you smile. 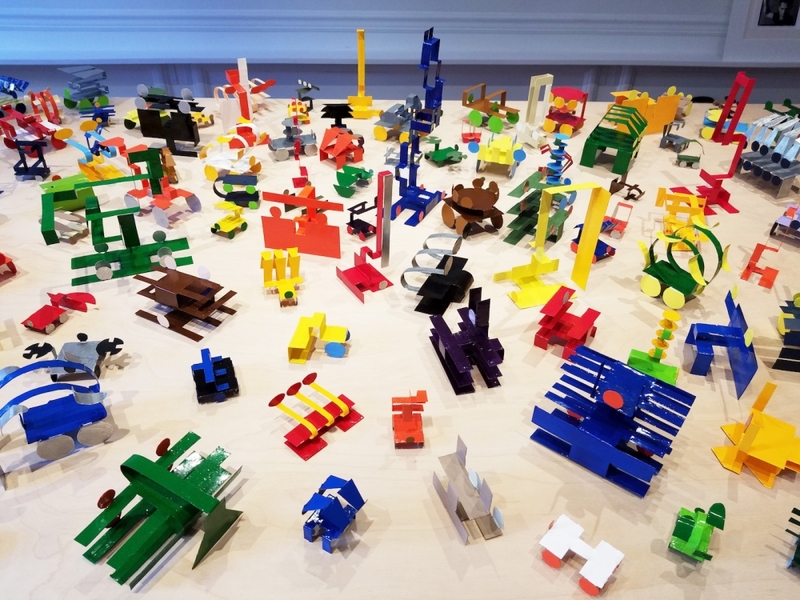 Toys have been a steady source for Macdonald at least since the mid-1980s, when he began to achieve recognition for his chunky, blocky wood sculptures that caricature heavy trucks, agricultural machinery, construction equipment — stuff associated with manual labor. For me, these read in part as send-ups of the genre of rough-hewn, macho, fork-lift-enabled sculpture that arose in the US the 1960s. There’s nothing snarky or spoofy about them — just a playful incongruity. Most of the recent works at Wahlstedt (all are untitled, and dated 2015 or 2016) would fit in the flat of your hand, and they look like they weigh next to nothing. Many allude to toys, particularly vehicles: they are at least roughly symmetrical along one axis, have a front end and a back end, and feature disks (for wheels) cut out of and/or added to them. Others are more elongated, entirely abstract, and, compared with their companions, disconcertingly monumental in proportion and visual heft; one can imagine these as maquettes for much larger works (although there is no particular reason to think they are intended as such). A few pieces are as small as a brooch. Covered with an all-over arrangement of hard-edged shapes in snappy colors, the table looks a bit like a painting — at least, it refers to the rectilinear delimitation of the conventional painted field, albeit horizontally oriented. And it also brings to mind the image of a disorderly amusement park, after hours. The consistently buoyant tone and inventive formation of the work makes trying to pick favorites an exercise in futility, but some are particularly intriguing: a green biplane-like object (equipped with several extra pairs of wings) that, from a certain angle, morphs into a humanoid face; a butter-yellow abstraction with the dignity of a ceremonial gateway; a blue-and-silver tractor and/or baby carriage; an odd-looking configuration that, with five curling ribs, might be a rudimentary percussion instrument. Whereas Macdonald’s previous work relied on the viewer’s recognition of typological generalities to make the connection with toys, the recent sculpture is more varied and, while not particularly literal, speaks the formal language of vehicles as specialized tools with forms that follow their function: earth moving equipment, armored car, limousine, street sweeper, bread truck, padded wagon, parade float, Zamboni. Others vaguely suggest a semi-architectural program: bandshell, pavilion, cabana, kiosk. They feel aggressively analog, in part because their technical means instantly recalls origami, a quintessentially manual craft. They don’t appear to be quite as vulnerable as folded paper, but a stiff breeze would likely blow them away. Part of their considerable charm is that they look like they were made quickly, without undue fuss. In that respect they connect to the work of artists (like Richard Tuttle) for whom procedural labor and niceties of craft are jettisoned as sources of value or meaning for individual works. Meaning does accrue, however, to the works’ collective presentation. In what is essentially a sculptural installation, many small Macdonalds are gathered into one big Macdonald. Each work signifies in two ways — as itself, and as part of the larger creative enterprise. This is another Tuttlesque strategy, and Macdonald’s installation capitalizes on the cumulative effect of a materially modest achievement repeated over and over. Also relevant in this regard are Gabriel Orozco’s “Working Tables” (2000-2005) on which are typically displayed many small pieces that are formally varied and distinct but conceptually or thematically interrelated. Lined up atop this townhouse gallery’s fireplace mantle is a 55-inch-long concatenation of a dozen or so cars, variously configured and colored but made in the same ad hoc, antiheroic manner as the works on the big table. Identified as a single piece but clearly composed of distinct sections, it is a witty twist on the show’s parts-to-the-whole conceit. It is also the most easily labeled object in the show, quite clearly a train with a big red engine. Is Macdonald trying to tell us that, in some important sense, artworks are toys — that there is no significant difference between the two categories of objects? We can surmise that he wants his work to provide pleasure, enjoyment, maybe even amusement. How far to take this implication is unclear, naturally, but it’s worth considering a couple of highlights in this tradition. The value of Macdonald’s work is probably not that the viewer can pick it up and pretend to be a farmer or fireman or freight train engineer. But to experience it is to relive (briefly, imaginatively) that developmental stage when we learned about how objects, stories and fantasies are all mixed up together, and how sad it would be not to have them. Chris Macdonald: Recent Sculpture continues at Anders Wahlstedt Fine Art (40 East 63rd Street, 3rd Floor, Midtown, Manhattan) through October 21.